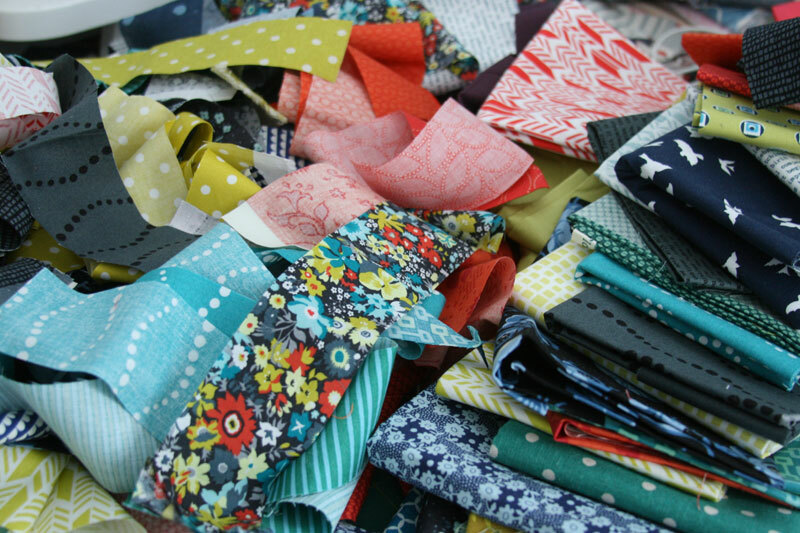 Well, I just spent a good 30 minutes searching old blog posts to link back to this stack of fabric only to realize that I had never actually blogged about it – I finally remembered that I had shown it on Instagram instead. My brain these days… not good! Anyway, I pulled together that stack back in October, and then added to it in January and I’ve been waiting ever since to have a chance to start a quilt with them. I finally got most of my sewing obligations completed, so I thought it was a great time to sneak in a little work on this one. I’ve been wanting to make a Feather Bed quilt ever since Anna Maria Horner posted her pattern, and since then I’ve seen many beautiful versions – the latest being this beauty by Karyn. 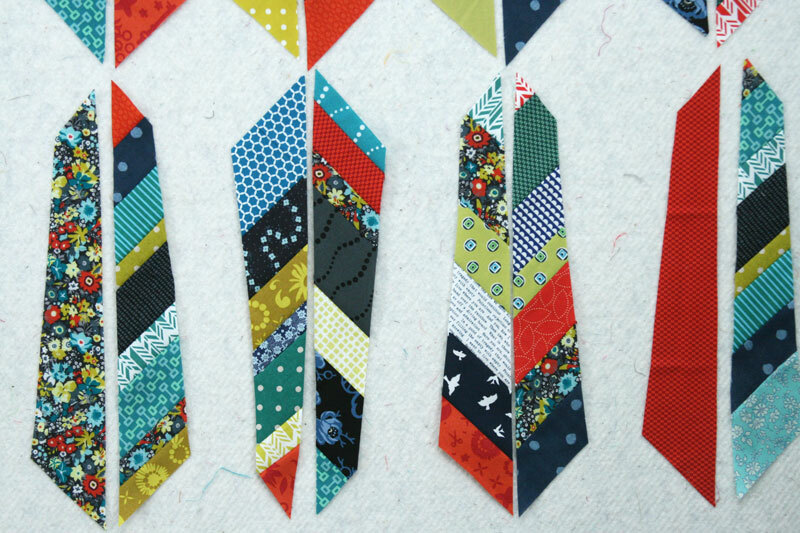 I spent the afternoon yesterday sewing strips and cutting out feathers, and oh my, what fun! That part was surprisingly quick, and I’m loving how it’s looking up on the wall. I still need to figure out how big to go, and then hopefully soon I’ll be on to the next step! This entry was posted in Fabric, Posts about Quilts and tagged alison glass, anna maria horner, feather bed quilt pattern, feathers, liberty of london, primary colors, quilt, Quilt Blocks. Bookmark the permalink. 13 Responses to in progress…feathers! So pretty! I think this is one of my favorite patterns of all time! I can’t wait to see yours completed. What color are you going to do for the background? i am loving your feathers! and i really (really) like the color scheme. i have been thinking i want to use more navy in my work. and i am always a sucker for the “sour lemon” color. When I first saw your IG pic I did think you chose the fabrics based on that Liberty print! Great feathers! This is so beautiful! I’m just wondering what the name of the Liberty floral is? It is amazing! I *love* mixing textures, and your colors are absolutely brilliant! I LOVE LOVE LOVE the color combo!! This goes wonderfully together, also the different kinds of designs and prints. Just stunning! I love to see fabrics of different textures mixed together and just wish I would be so brave too. This is going to be an INCREDIBLE quilt! Can’t wait to see when the top is done. Love your feathers! 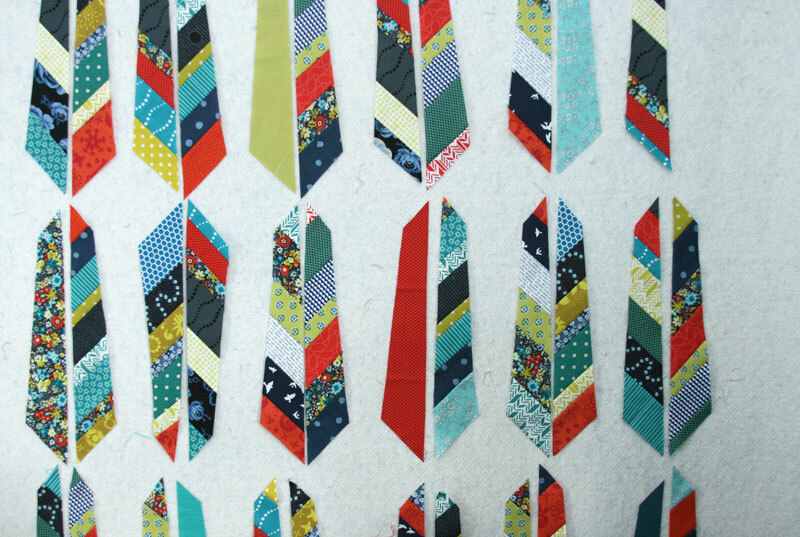 !This is going to be such a happy quilt!! The dark blue is a great asset here! Inspiring, as usual. I’ve wanted to make these for some time. Another project that’s joining several others at the top of the list! OHHH, so different! Love them and can’t wait to see the finish! Beautiful fabrics – again and so inspirational – again! Was aiming to work on Flying Farfalle as a wedding quilt for my nephew (wedding in August) but, after yesterday, have fallen truly, madly, deeply in love with Feathers. I’m in process of moving house and going to temporary accommodation so extracting “work in progress” projects to work on while I’m waiting – one of those is the Love Letters quilt (with the retro typewriter) for my new home. Love your blog – always inspiring!